The line “unteachably after evil, but uttering truth” William Giraldi selects as an epigraph for his recent novel Hold the Dark. At the book’s center lies Hopkins’ idea that the human heart, without instruction, pursues evil, yet also speaks truth. This understanding seeks to reconcile our brokenness with our ability to serve as channels of grace, and as such, is profoundly Catholic (Hopkins was, after all, a Jesuit). 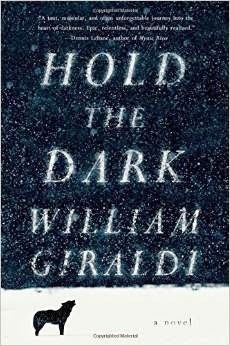 Contrary to the title of his novel, Giraldi does not withhold much “dark” from this book—it is filled with as much brutality and evil as any book I have read in recent years, and is certainly not for the weak-kneed. Yet the story springs from a deeply religious, even mythical sensibility, and, as Hopkins’ lines suggest, attempts to utter truth in its focus on the darkest regions of the human spirit. The story begins with the report that children from a remote Alaska village have been getting snatched from their town by wolves. The mother of one such child, Medora Slone, reads a book by wolf expert Russell Core and writes to him for help hunting the wolf who took her six-year-old boy. Core, sixty years old and with a terminally ill wife, cannot explain why he is drawn to Slone’s request, but he goes in spite of himself, flying and then driving into the dark, cold of deep Alaska. Core is an experienced hunter and tracker, but is unnerved by the extremes of the Alaskan climate and the strange village of Keelut. As he sets out to hunt down the wolf pack, he meets an old Yup’ik woman who lives in a shack on the edge of town. She knows he is looking for the wolves, but warns him that he’s headed in the wrong direction and instead points him back to the village. Core ignores her warning. He locates the wolf pack and scatters it from the valley, but returns to the village to uncover a terrible secret. The old woman, it turns out, was right. Though all of this happens close to the beginning, I don’t want to give away too much here. Giraldi’s novel hinges on suspense and it’s worth reading it knowing as little as possible about what he reveals. But it’s safe to say that at this point the novel turns sharply inward, and remains focused not just on the wolves in the wilderness but the wolves inside of men. The novel’s pace picks up, shot along by Giraldi’s tight prose—imagine Hemingway’s efficiency yoked to Hopkins’ arresting force. Medora Slone disappears, and her husband Vernon returns from military duty in the Middle East to find his son dead and wife gone. Slone the husband is cut from the same brutal nihilism of Cormac McCarthy’s villains, and he displays little regard for the lives of others as he asserts his authority over the local police and pursues his wife into the wild. A bloodbath ensues, with the police and Core chasing both husband and wife deep into the wilderness, toward a climax that occurs in the coldest, darkest regions of nature and the self. In an article for the Daily Beast Giraldi complains about people comparing him to McCarthy, because, he says, he wasn’t trying to imitate him, and, besides, he doesn’t even think McCarthy is all that great. Giraldi’s skin is a bit thin—if you’re an American author who writes a refined, dark, violent, novel the comparison to McCarthy is inevitable—but his larger point in the essay rings true: that any similarities between the two authors are the result of shared influences. As I made my way through Hold the Dark I wasn’t so much thinking of McCarthy but of Dante, who, like the aptly named Russell Core, must come to know himself by spiraling down into the darkest reaches of the soul; of the journey of Conrad’s Marlow, which becomes more mythical the deeper he steams into the African wilderness; of Flannery O’Connor, whose art, as a Catholic, sought to make the spiritual world manifest in the physical, often through shocking violence. Giraldi, too, is a writer with a profoundly Catholic sensibility. Unlike O’Connor, he is neither devout nor practicing, but he was raised Catholic and his novel remains rooted in a sacramental understanding. Inner and outer landscapes are inextricably fused. The dark woods, the biting cold, the ravenous wolves all serve as mirrors of the soul. To understand this new territory, Core has to leave behind the ways of seeing of the modern world. He may have been a “wolf expert” in the technocratic “Lower 48,” as the rest of the country is called throughout the book, but to be a true expert on wolves, at the far reaches of the Alaskan tundra, means understanding the wolf within us. For this purpose his scientific knowledge fails, and Core finds himself in the realm of myth. Like O’Connor before him, Giraldi writes out of the tradition of the grotesque. The book’s extremes—of location, of temperature, of violence—do for him what distorted, bizarre characters did for O’Connor. When your readers do not share your worldview, she wrote in “The Fiction Writer and His Country,” “you have to make your vision apparent by shock—to the hard of hearing you shout, and for the almost blind you draw large and startling figures.” Hold the Dark certainly shocks. The characters appear half-feral, and the book is certainly not for the faint of heart. Yet Giraldi’s book does not shock, as so many books and films do, for the sake of shock; rather, it’s his attempt to shake us out of our modern sensibility, blind as it is to the realities of the spirit. In addition to its reference to the divided nature of the human heart, Hopkins’ epigraph—“Unteachably after evil, but uttering truth”—also refers to the poet’s tears that “unteachably” follow evil, that spring naturally from considering the suffering of the five nuns. Hopkins writes, almost ashamedly, of his “glee” in the retelling (“What can it be, this glee? the good you have there of your own?”). To shape the disaster into story is its own good, and brings a distinct joy. The epigraph takes on a double meaning, then, referring to the human response to darkness, specifically, to our ability to communicate evil through a story. She’d want to know all he’d witnessed. She’d want to hear the truth of these events. But he would have for her only a story—one that seemed to have happened half in dream, rent from the regular world he knew—and that story would wear the clothes of truth. Propped up bed, he prepared himself for this tale. He searched for the beginning, and for the will to believe it.